MANILA, Philippines – The 'March 2017 Mechanical Engineer (ME) and Certified Plant Mechanic (CPM) board exam results', together with the list of passers, top 10 examinees, top performing schools and related announcements are available at this website as PRC officially released the results online three (3) working days after the last day of board examination. As announced, 1,083 out of 1,904 passed the Mechanical Engineer Licensure Examination and 19 out of 39 passed the Certified Plant Mechanic Licensure Examination. 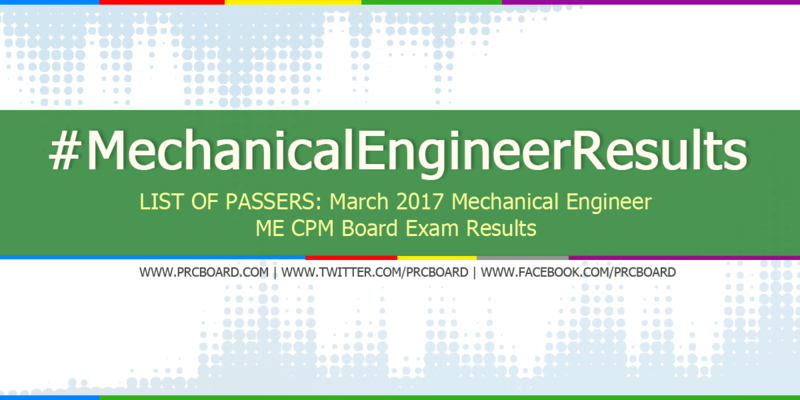 The March 2017 Mechanical Engineer and Certified Plant Mechanic board exams are administered by PRC Board of Mechanical Engineering headed by its Chairman, Engr. Jesus M. Redelosa (inhibited) and its members, Engr. Fernando S. Guevara and Engr. Mirardo C. Malazarte, Jr. on March 18-19, 2017 at PRC testing centers in Manila, Baguio and Cebu. The schedule of online appointment for issuance of Professional ID and Certificate of Registration will be from March 30 to April 5, 2017. Registration requirements: duly accomplished Oath Form, latest/current CTC or cedula, 2 pieces of colored passport ID picture with white background and name tag, 2 sets of doc stamps and 1 short envelope with name and profession written. According to the Commission’s Resolution No. 2016-1019 series of 2016 entitled “Schedule of Licensure Examination for Year 2017”, the target release date for the results of March 2017 ME and CPM board exams will be on March 22, 2017 (Wednesday). However, results may be released earlier or later without prior notice. On the same exam conducted by PRC on September 2016, results were out after six (6) working days while three (3) working days during March 2016 exams. During March 2016 ME board exams, 910 out of 1,645 passed the ME licensure examination while 33 out of 53 passed the CPM. Batangas State University was the only school in the top performing school list having 59 out of 61 examinees passed or 96.72% overall passing rate. Marina Melendres Luchavez from University of Cebu ranked first in Mechanical Engineer board exam garnering 91.60% rating. She was followed by Neil Ivan Jon Buquing Domingo from the same school having 91.15% and Jossua Añonuevo Corona from Batangas State University-Batangas City Campus having 88.90%. Meanwhile, here is the summary of results for Mechanical Engineering board exams in the last two (2) years. To receive up-to-date news about March 2017 Mechanical Engineer and Certified Plant Mechanic board exams results, we advise our visitors to bookmark this page, visit PRC official website or follow us at our social media pages via Facebook and Twitter.